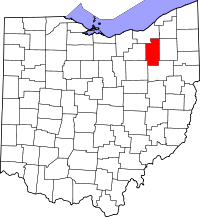 Location in Summit County and the state of Ohio. Hudson is a city in Summit County, Ohio, United States. The population was 22,262 at the 2010 census. 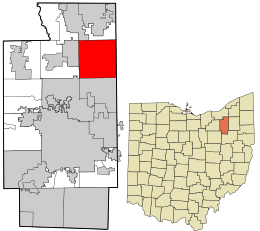 It a suburban community in the Akron Metropolitan Statistical Area and the larger Cleveland–Akron–Canton Combined Statistical Area, the 15th largest Combined Statistical Area in the United States. 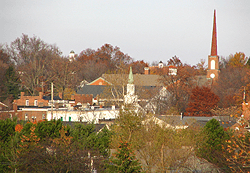 The city is named after its founder, David Hudson, who settled there from Goshen, Connecticut in 1799, when it was part of the Connecticut Western Reserve. Hudson was a stop on the Underground Railroad. The Hudson-born Pennsylvania coal mine owner James Ellsworth assisted in the rebuilding of Main Street with a new clock tower after the street had been destroyed by fire in 1903. Ellsworth also refinanced the bankrupt Western Reserve Academy which had been closed from 1903 until 1916. On November 28, 1973, a large area of the village, "roughly bounded by College, Streetsboro, S. Main, and Baldwin" streets, was listed on the National Register of Historic Places as the Hudson Historic District. The historic district was expanded on October 10, 1989, to also include the area "roughly bounded by Hudson St., Old Orchard Dr., Aurora St., Oviatt St., Streetsboro St., and College St. to Aurora (street)". In addition to the Hudson Historic District, there are several additional properties in Hudson listed on the Register. From 1837 to 1994, the Village of Hudson and Hudson Township were two separate governing entities. In 1994, voters approved a merger uniting the two to create the City of Hudson. Hudson is located in northeastern Summit County. According to the United States Census Bureau, the city has a total area of 25.87 square miles (67.00 km2), of which 25.60 square miles (66.30 km2) is land and 0.27 square miles (0.70 km2) is water. Hudson's surface water flows into five major watersheds. The three most prominent are Brandywine Creek, Mud Brook, and Tinkers Creek. A small part of the western edge of town drains into the Cuyahoga River, and the southeastern corner of the city drains into Fish Creek. The Hudson Park Board oversees more than one thousand acres (4 km²) of parkland in the city. The most prominent property is Hudson Springs Park, which has a 50-acre lake open to kayaks, canoes and small motorized boats. Boat storage is available to residents only for an annual fee. The lake is stocked with fish and encircled by a walking trail that ventures into the woods that stretch along a large portion of the lake. The park also has a disc golf course, docks, sand volleyball pit and permanent corn-hole boards (bring your own bean bags). Cascade Park, Barlow Farm Park, and Colony Park are large neighborhood parks used for sports and general family recreation. Other properties, such as Doc's Woods, MacLaren Woods, Trumbull Woods, and Bicentennial Woods, are kept as forested nature preserves. The first Hudson Park, Wildlife Woods, is actually located west of the city in the Cuyahoga Valley National Park. Of the city's population over the age of 25, 68.0% held a bachelor's degree or higher.According to a 2007 estimate, the median income for a household in the city was $112,740, and the median income for a family was $128,727. Males had a median income of $87,169 versus $38,226 for females. The per capita income for the city was $40,915. About 1.3% of families and 1.7% of the population were below the poverty line, including 2.2% of those under age 18 and 2.0% of those age 65 or over. Note: Historical Population figures before 2000 are for the former Village of Hudson only and do not include the former Hudson Township. As of the census of 2010, there were 22,262 people, 7,620 households, and 6,301 families residing in the city. The population density was 869.6 inhabitants per square mile (335.8/km2). There were 8,002 housing units at an average density of 312.6 per square mile (120.7/km2). The racial makeup of the city was 92.7% White, 1.3% African American, 0.1% Native American, 4.3% Asian, 0.3% from other races, and 1.3% from two or more races. Hispanic or Latino of any race were 1.7% of the population. There were 7,620 households of which 43.2% had children under the age of 18 living with them, 74.9% were married couples living together, 5.9% had a female householder with no husband present, 1.9% had a male householder with no wife present, and 17.3% were non-families. 15.3% of all households were made up of individuals and 8.4% had someone living alone who was 65 years of age or older. The average household size was 2.87 and the average family size was 3.21. The median age in the city was 42.5 years. 30.1% of residents were under the age of 18; 5.5% were between the ages of 18 and 24; 18.5% were from 25 to 44; 34% were from 45 to 64; and 11.8% were 65 years of age or older. The gender makeup of the city was 49.1% male and 50.9% female. As of the 2000 census, there were 22,439 people, 7,357 households, and 6,349 families residing in the city. The population density was 876.9 people per square mile (338.6/km²). There were 7,636 housing units at an average density of 298.4 per square mile (115.2/km²). The racial makeup of the city was 94.65% White, 2.82% Asian, 1.48% African American, 0.09% Native American, 0.20% from other races, and 0.75% from two or more races. Hispanic or Latino of any race were 0.82% of the population. There were 7,357 households out of which 49.5% had children under the age of 18 living with them, 79.7% were married couples living together, 5.1% had a female householder with no husband present, and 13.7% were non-families. 12.3% of all households were made up of individuals and 6.5% had someone living alone who was 65 years of age or older. The average household size was 3.01 and the average family size was 3.30. In the city the population was spread out with 33.5% under the age of 18, 4.1% from 18 to 24, 25.4% from 25 to 44, 27.7% from 45 to 64, and 9.4% who were 65 years of age or older. The median age was 39 years. For every 100 females there were 98.5 males. For every 100 females age 18 and over, there were 93.0 males. Ohio's State Route 303, State Route 91, and State Route 8 pass through Hudson. Interstate 480 cuts through the extreme northeast corner of the city, and Interstate 80, the Ohio Turnpike, bisects the city from west to east. Hudson, unlike many surrounding communities, has retained two-lane roadways in much of its downtown. This has helped preserve the open spaces, historical buildings, and trees that the city values. However, this can also significantly lengthen the amount of time commuters spend in the downtown area. There are some services from Metro RTA, and much of Hudson is accessible by foot or bike. In November 2002, Hudson was the first community in the U.S. to launch a citywide electronic gift card. The card was introduced by the Hudson Chamber of Commerce to help stimulate and keep shopping dollars with the independent merchants in town. Jo-Ann Stores has its corporate headquarters in Hudson. Jo-Ann operates 751 stores in 48 states, plus its Web site, Joann.com. Its three distribution centers are located in Hudson, Ohio; Visalia, California; and Opelika, Alabama. Allstate Insurance Company established a call center/data center in Hudson in 1971. In 1991, it expanded the Hudson facility and now employs more than 1,300. Most of Hudson's retail outlets are located in concentrated areas. Most notable are the two downtown blocks of historic buildings located on North Main Street. The original center of business in Hudson, the stores and offices located "downtown" still stand today in continued commercial use. In 1962, the first part of the Hudson Plaza shopping center opened on West Streetsboro Street. It has always been anchored by the Acme grocery store, which moved there from its former location on North Main Street. Expansions of the plaza continued through the 1990s. A unique McDonald's restaurant, resembling a house, opened in 1985. The original building, housing Acme, was extensively renovated in 2000. 2004 marked the opening of First & Main, a mixed-use development just west of North Main Street. The Hudson Library & Historical Society relocated there in 2005. Public schools are included in the Hudson City School District. The largest school in the district is Hudson High School. There are also many private schools in the area. Seton Catholic School is one. Founded in 1962, Hudson Montessori School is the 13th oldest Montessori school in the United States. Hudson is the original home of what would become Case Western Reserve University in Cleveland and remains home to the Western Reserve Academy, a coeducational boarding and day college preparatory school housed on the original campus of Western Reserve College. The University Hospitals Hudson Health Center, affiliated with University Hospitals of Cleveland, offers primary and specialty care services, laboratory and general diagnostic radiology services. Also located at this facility are outpatient rehabilitation services. Today, the city is governed by a seven-member city council. There are four council representatives representing the four wards in Hudson, and three representatives at-large. Hudson has a council-manager government. At present, the Council President is Hal DeSaussure. The current City Manager is Jane Howington. The current Mayor is David A. Basil. In 2010, the city was named as one of the 100 Best Communities for Young People by America's Promise. The award was based on the city's "Community First" organization that was developed in the 1990s to combat drug use and school dropouts and to promote better choices for the city's youth by providing additional educational and cultural opportunities. In 1984, Hudson and Landsberg am Lech, Bavaria, Germany, became sister cities. There are many churches and other places of worship in Hudson. There are several Christian denominations present, including the Episcopal Church, United Church of Christ, Lutheran, Christian Science, Presbyterian, United Methodist, Anglican, and Roman Catholic, and non-denominational congregations as well as a Jewish temple. John Brown - Abolitionist moved to Hudson in 1805. James Ellsworth - Industrialist helped modernize Hudson in the early twentieth century. Lincoln Ellsworth - Polar explorer, and also the only Hudsonite ever featured on a U.S. postage stamp. Ian Frazier - Author and contributor to The New Yorker, is a Western Reserve Academy graduate and Hudsonite. 1 2 Freeman, Laura (2 February 2014). "COUNCIL PRESIDENT APPOINTS MEMBER LIAISON ASSIGNMENTS FOR 2014, 2015". Hudson Hub-Times. Record-Courier. Retrieved 10 November 2014. 1 2 "US Gazetteer files 2010". United States Census Bureau. Retrieved 2013-01-06. 1 2 "American FactFinder". United States Census Bureau. Retrieved 2013-01-06. 1 2 3 "American FactFinder". United States Census Bureau. Retrieved 2008-01-31. ↑ Gannett, Henry (1905). The Origin of Certain Place Names in the United States. Govt. Print. Off. p. 162. ↑ http://www.hudson.oh.us/departments/ISGIS/maps/MajorWatersheds_11x17.pdf City of Hudson Major Watersheds. City of Hudson, Department of Public Works, GIS Division. retrieved July 9, 2006. ↑ http://www.hudson.oh.us/elements/parks%20brochure.pdf Hudson Parks brochure. retrieved July 9, 2006. ↑ "Population: Ohio" (PDF). 1910 U.S. Census. U.S. Census Bureau. Retrieved 28 November 2013. ↑ "Population: Ohio" (PDF). 1930 US Census. U.S. Census Bureau. Retrieved 28 November 2013. ↑ "Number of Inhabitants: Ohio" (PDF). 18th Census of the United States. U.S. Census Bureau. Retrieved 22 November 2013. ↑ "Ohio: Population and Housing Unit Counts" (PDF). U.S. Census Bureau. Retrieved 22 November 2013. ↑ "Incorporated Places and Minor Civil Divisions Datasets: Subcounty Population Estimates: April 1, 2010 to July 1, 2012". U.S. Census Bureau. Retrieved 25 November 2013. ↑ "Population estimates, July 1, 2015, (V2015)". Retrieved 1 September 2016. ↑ "Business Success Story - Hudson, OH - Official Website". Retrieved 1 September 2016. ↑ "First & Main Hudson". 2012. Retrieved December 14, 2015. ↑ "UH Hudson Health Center". University Hospitals of Cleveland. 2015. Retrieved December 14, 2015. ↑ http://www.hudson.oh.us/government/council/index.asp Council of the City of Hudson. ↑ "Mayor". Hudson, OH. Retrieved 3 December 2015. ↑ "Hudson, Ohio". AmericasPromise.org. 2010. Retrieved 22 September 2010. ↑ http://www.hudson.oh.us/profile/sistercity.asp City of Hudson: Sister City. retrieved July 9, 2006. Wikimedia Commons has media related to Hudson, Ohio.